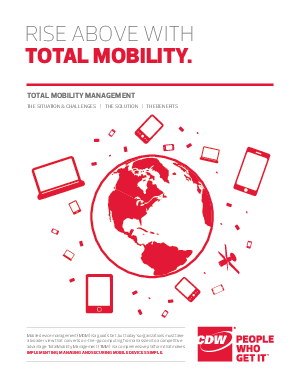 CDW » RISE ABOVE WITH TOTAL MOBILITY. Patchwork deployment - When the organization lacks a central mobile strategy, IT often improvises its policies, apps, clo ud solutions and management tools. This is a recipe for inefficiency, incompatibility, and poor scalability. Mobile Multiplicity- When two out of every three employees use a mobile device for work, IT must inevitably cope with a broad spectrum of devices, platforms and carriers. The excuse of “we don’t support your device” will not suffice. Security and Policy- Smart organizations must implement smart policies. These policies will fit organizational needs and help ensure that workers stay happy but data remains safe against a host of challenges. Total Mobility Management (TMM) is a comprehensive platform that makes implementing, managing, and securing mobile devices simple.